Point2 Homes gives you far more than a simple list of houses for sale. Get instant access to a lot of relevant information about Oliver, Edmonton, AB real estate, including property descriptions, virtual tours, maps and photos. The search results pages also have a wealth of information on Oliver, Edmonton, AB, if you scroll all the way down. There are 144 houses for sale in Oliver, Edmonton, AB. Searching homes for sale in Oliver, Edmonton, AB has never been more convenient. With Point2 Homes, you can easily browse through Oliver, Edmonton, AB single family homes for sale, townhomes, condos and commercial properties, and quickly get a general perspective of the real estate prices. Also, you’ll never miss a bargain if you filter listings based on house price drops in the past six months. Use the map view to find Oliver, Edmonton, AB homes and apartments for sale, based on amenities or city features that you may want close by. You can close in on a specific neighbourhood or area by simply drawing around them with the polygon or radius tools. Stay informed about the latest entries on the real estate market by saving your searches. This way, you get new listings in your inbox, daily or every week, based on your preferences. If you’d like to get in touch with a professional, agents are displayed next to their listings, and they’re easy to contact through the online forms. If you want more options, you can click the Tools tab and Find an Agent, and you’ll get a list of helpful and knowledgeable real estate agents in Oliver, Edmonton, AB. Visit the Point2 Homes blog and you can find up to date expert advice on many markets throughout Canada, regular market reports, neighbourhood scoops in cities throughout the provinces, real estate deals and useful recommendations. 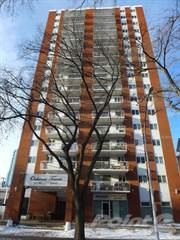 Situated directly West of downtown, Oliver is one of Edmonton’s oldest neighborhoods. Though Edmonton as a whole is not a very densely populated city this area is quite the opposite. Jasper Avenue is the main avenue in Edmonton and it stretches through Downtown as well as the Oliver district; along it, there are many high-rise condos and apartment buildings. These densely populated areas along with the many blocks of old houses make Oliver a very interesting and diverse neighborhood. Not only do you get quick access to downtown, skyscrapers and shopping areas, but you also get the feel of a quiet community on the outskirts of the river valley. This unique combination creates both modern convenience along with the variety that comes with dense population and historic buildings. An interesting and vibrant mix is the best way to describe the atmosphere in Oliver. As mentioned, Jasper Avenue is the main avenue in all of Edmonton; you can really split Jasper Avenue into two halves: the half that goes through downtown and the half that goes through Oliver. This is also one of the main reasons why Oliver has the feel of being right downtown. There are skyscrapers like The Pearl. which is a 36-story condo complex that is interwoven with many old residential housing blocks . 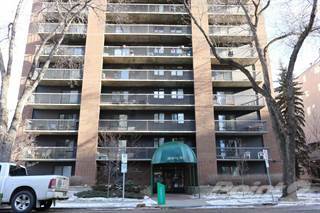 The General layout of Oliver is high rise condo buildings along Jasper Avenue with houses and smaller condo buildings situated in the surrounding blocks. The neighbourhood as a whole is both a very convenient place to live and offers piece and quiet as well. The area has many restaurants and they include some of the finest in Edmonton, like the Cactus Club and an Edmonton, Alberta favorite La Shish. On the peace and quiet side, Oliver is bordered by Edmonton’s River Valley. 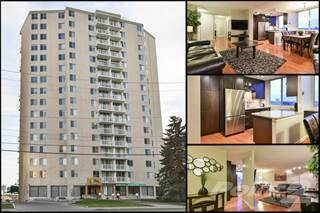 It is an easy walk from anywhere in Oliver to many great jogging, walking or cycling paths. Also, it is a great location for golf lovers, with a full 18-hole golf course and driving range just a short walk away. There isn’t that much entertainment directly in Oliver but it is very close to downtown which offers plenty of entertainment options in terms of theaters and shopping. With regards to outdoor activities, Oliver is one of the best areas in any city in the world. As mentioned, the river valley offers plenty of activities like cross country skiing, mountain biking, golfing, skating and many more. It is a unique area as you can both love city life or being in the midst of nature, and this area will have plenty to offer. Oliver also has plenty of restaurants and shops. One of Edmontonians’ favourite shopping areas is on the 124th Street which is at the far West end of the district; 124th Street has plenty of trendy shops and cafes. Furthermore, there is Oliver Square which is a shopping center located on the North side of Oliver. Oliver has a very interesting and diverse housing and real estate market. There is a mix of state-of-the-art new high-rise condo buildings and old houses on block type grids. Generally speaking, housing gets more expensive the closer to the river valley you get. On the North end of the neighborhood, furthest from the river valley, you can find nice condos much cheaper than in the river valley. The river valley is very wide and deep and offers some amazing views; however, if you want a sightline it runs at quite a premium. Housing prices in this area again depend on location; still, the price depends more on the age of the house and whether or not it has been renovated. This is a very popular area to buy and renovate old houses. Some of the houses are over 100 years old, so it really depends how well maintained they are. There are a few houses in this area that aren’t really even livable as they are so old and unmaintained; but many have been newly renovated and as a result are quite nice. Clearly, old houses in need of TLC will be quite a bit cheaper than new or renovated ones. The Oliver district is densely populated and close to downtown thus you are going to get some pollution and noise. With that said, it still is well within good limits. The river valley is a massive green space that really keeps the air fresh. While the area is certainly heavily populated, it does not boast a prolific nightlife. Most bars are located downtown so the area is not all that loud. While Jasper Avenue gets lots of traffic, the areas off Jasper are still reasonably quiet. Oliver area has one of the highest crime rates in total numbers in all of Edmonton. However, one should realize it is also the highest populated area. If you look at average crime rates, Oliver is comparable to many other lower crime areas. It gets some crime as a result of it being so close to downtown but it should not be considered as a particularly high crime area. Oliver really has a great mix of school options for just about anyone’s needs. Like Downtown, the area is popular among university and college students as it is a short walk or transit ride to the University of Alberta and Grant McEwan University. Oliver also has a good selection of public schools from kindergarten to grade 12. The largest school in the area is Oliver School which is one of the oldest schools in all of Edmonton. It offers a full elementary program along with some early learning programs. There are many public transportation options in the Oliver area, as it is very close to downtown and the LRT (light rail transit). Many major buses run up and down Jasper Avenue, and on the East side of Oliver there are two LRT stations. The neighbourhood is home to more young couples and single people than most areas. Like in the case of downtown, this is due to the easy access to secondary education and the nightlife of downtown. However, there are many families that call the area home as well and it is a good place to raise a family.